We’d love your help. Let us know what’s wrong with this preview of Mỹrwen of Amaranaca by Ashley Frerking. Join Melinda as she morph Mỹrwen of Amaranaca tells of a young woman’s courage and kind heart as she fulfills her destiny. To ask other readers questions about Mỹrwen of Amaranaca, please sign up. What a great, easy read! Enjoyed every moment and character. Definitely would recommend to friends for a quick fantasy thrill! Read it in a day and finished it smiling! Wonderful world building and a main character you love and relate to right from the start! This is a well-written young-adult fantasy with a strong female protagonist. I enjoyed reading it and hope there will be a sequel. Really loved it! Great protagonist and supporting characters. The primary antagonist even has some nice complexity and depth. The potential relationship between (view spoiler)[Amistar and Käywn (hide spoiler)] is adorable and awesome. Overall, really good and definitely worth checking out for anyone who enjoys YA Fantasy. Had me from the start. Written in such a way that it is easy to follow the characters. Looking forward to reading Ashley's next book. Frerking delivers a wonderfully written fantasy novel centered on a young girl named Melinda. Relatable in many different ways, Melinda is someone readers can easily see themselves in. She is kind, loving, and wants to have that normal school life many see on television except these simple pleasures have eluded her due to frequent sickness. Melinda is left with little to no friends because of how often she misses out on school and building a social life, but everything changes when a mysterious Frerking delivers a wonderfully written fantasy novel centered on a young girl named Melinda. Relatable in many different ways, Melinda is someone readers can easily see themselves in. She is kind, loving, and wants to have that normal school life many see on television except these simple pleasures have eluded her due to frequent sickness. Melinda is left with little to no friends because of how often she misses out on school and building a social life, but everything changes when a mysterious boy enters her life and reveals that she is actually a princess from another world. In a new body, in a new world, with servants and sworn companions, Melinda finds herself on a journey she couldn’t even dream up if she’d wanted to. In the world of Amaranaca, Melinda is known as Myrwen—a lost princess—and she is free of illness, struggle, and her pitiful solitude. She treats her servants as friends and bravely sets off on an adventure that will define her as a leader and a member of the royal family. Myrwen is quick to learn and adapt to this new world and she handles the challenges thrown her way with distinguished maturity. Her companions make for a great cast and the world-building paired with the easy flowing writing pulled the story together to make this book an easy and enjoyable read for all ages. I love fantasy/adventure stories so when the author, Ashley Frerking, offered me this book, I said yes. But unfortunately, because of my schedule and mood, I wasn’t able to read it sooner. And finally! Just this morning, I was able to finish it. Yass! This story has a very interesting sypnosis, which is why I decided to give it a shot in the first place. I’m not sure if it was with my mood, but I started to read this book last February but only managed to finish it today, lol. I honestly liked the idea of an unpopular girl who’s always sick then one day found out that she’s from another world. But that world is currently in chaos and she got no choice but to be brave and grab herself a sword. It was an interesting read but unfortunately, I’m more of a dialogue reader and this one only contains a little of it (which is usually common in an adventure story anyway). Far from what I expected, this one didn’t able to hold my attention until I reached the part where romance is finally visible, and it’s not a one-sided love after all, *wink. Even though it was a bit sudden, it was still able to grab my attention because you know me, I’m a sucker for romance haha. Aside from that, I also noticed that it was almost a bit easy. Like after second try, Mỹrwen was able to defeat the bad guy that fast. Don’t get me wrong, I love HEA but this one is like a paradise of HEA which is making it very unrealistic for me. I’m not usually like this lol, I always always love my HEA, so I think it’s just my mood talking. Also, there were a time where I got confused with the shifting of narration, but it wasn’t that bad I guess. Even after all of that, I still think Mỹrwen of Amaranaca is an interesting read, so you may still want to give it a try, *wink. Melinda is a teenage girl whose height and thin frame already make her stand out in school, and she has no close friends because she’s always sick. A mysterious boy enters her life and reveals that she is really Mỹrwen, a lost princess from another world called Amaranaca. There’s a strong theme of wish-fulfillment in Mỹrwen of Amaranaca. As soon as Melinda arrives in her new world she discovers that, however nice she might have looked before, she’s now a beautiful elf maiden with innate skills ju Melinda is a teenage girl whose height and thin frame already make her stand out in school, and she has no close friends because she’s always sick. A mysterious boy enters her life and reveals that she is really Mỹrwen, a lost princess from another world called Amaranaca. There’s a strong theme of wish-fulfillment in Mỹrwen of Amaranaca. As soon as Melinda arrives in her new world she discovers that, however nice she might have looked before, she’s now a beautiful elf maiden with innate skills just waiting to be discovered. Fighting and riding skills come to Mỹrwen almost as easily as her new looks; even the central conflict is resolved so quickly, the main character herself remarks on it. It’s possible to imagine that a story about a protagonist everyone is in a rush to serve would appeal to a reader struggling with less exciting realities. The weakest aspect of the book was characterization. We’re told that Melinda and her mysterious suitor have a rapport instead of seeing it develop and that doesn’t change until a sudden POV shift much later. Mỹrwen’s relationship with her parents goes through a dramatic shift in perspective early on, but it’s hard to imagine the way they treat each other would change as quickly as it does in response to that shift. Mỹrwen’s servants and guides, who she treats as friends, come off a little flat; Mỹrwen mourns the loss of one of her new friends with a lot of grieving I had trouble connecting with because I barely knew them. 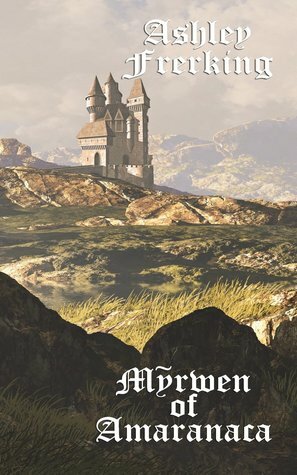 If you like Lord of the Rings or are a fan of fantasy, you'll love Myrwen of Amaranaca! It is well written yet easy to get into. The plot isn't difficult to follow as some fantasy reads can be due to the nature of the genre. I really enjoyed the story line and would recommend this for all ages. I would definitely read anything Ms. Frerking puts out! This is a quick and enjoyable read with a satisfying ending that I appreciated! I know my kids will also enjoy this one once they're a little older! classic bravery, honor, and even a sweet, innocent romance were all present. it was a fun one! This is an excellent read for any young adult! Wonderful story, well written. I couldn't put it down! * If you love Fantasy, this is a great story for you. This was a good story and a quick read! I could have happily had another 50 pages and more character interaction, but I guess that’s where the eventual sequel will come in! It was wonderful! I love the characters and was able to connect with them. The plot flowed smoothly and was easy to follow. If you want a nice, quick read, this is perfect. Wonderfully written! Ashley Frerking published her debut novel Myrwen of Amaranaca in October 2017. She is currently writing the sequel, Tura the Traveler, book 2 in her Lineage Series featuring descendants of Myrwen. Ashley has written articles for Deliberate Magazine, Kingdom Grower's Coffee, and The Praying Woman. Ashley Frerking published her debut novel Mỹrwen of Amaranaca in October 2017. She is currently writing the sequel, Tura the Traveler, book 2 in her Lineage Series featuring descendants of Mỹrwen.